Cambridge student Serena Frome's beauty and intelligence make her the ideal recruit for MI5. The year is 1972. The Cold War is far from over. England's legendary intelligence agency is determined to manipulate the cultural conversation by funding writers whose politics align with those of the government. The operation is code named "Sweet Tooth." Serena, a compulsive reader of novels, is the perfect candidate to infiltrate the literary circle of a promising young writer named Tom Haley. At first, she loves the stories. Then she begins to love the man. How long can she conceal her undercover life? To answer that question, Serena must abandon the first rule of espionage: trust no one. Ian McEwan is the bestselling author of fourteen previous books, including the novels Solar; On Chesil Beach; Saturday; Atonement, winner of the National Book Critics Circle Award and the W. H. Smith Literary Award; The Comfort of Strangers and Black Dogs, both shortlisted for the Booker Prize; Amsterdam, winner of the Booker Prize; and The Child in Time, winner of the Whitbread Award. He has also authored the story collections First Love, Last Rites, winner of the Somerset Maugham Award, and In Between the Sheets. He lives in England. What is the significance of the epigraph taken from Timothy Garton-Ash’s The File: “If only I had met, on this search, a single clearly evil person”? How does it tie in with the major themes of Sweet Tooth and McEwan’s method of characterization? Why do you believe that the author chose to set a contemporary novel in the England of the 1970s during the lingering Cold War? What contemporary or otherwise timeless themes is McEwan able to treat by adopting this political-historical backdrop? In Chapter 18, Pierre speaks to MI5 of “the softest, sweetest part of the Cold War, the only truly interesting part, the war of ideas” (241). Does McEwan’s novel seem to support this sentiment? How does it treat the subject of a “war of ideas”? McEwan chooses to employ a female protagonist. Is she convincing? What surprises you about her character? Consider your response and reaction to her character. Is she likeable? Are you sympathetic to her? How does the author elicit this response from readers? How is she viewed by the other characters in the novel and how does this affect your own interpretation? Is Sweet Tooth truly a spy novel? How does it fulfill or defy your expectations of this genre? In addition to portraying spying for political purposes, how else is the theme of spying treated? Who in the novel is a spy? Who is spied on and for what purpose? McEwan uses espionage as a device to talk about a wide range of subjects, including secrecy, trust, deception, seduction, betrayal, and truth. Who is betrayed or deceived in the novel? How do they react to these deceptions or betrayals? Are there any characters who can be trusted? How does espionage become a metaphor for the deeper concerns of the novel—in other words, how does genre come to serve as both a symbol of and disguise for theme? 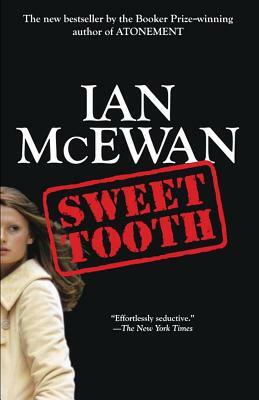 How does Sweet Tooth compare to McEwan’s 1990 spy novel The Innocent? What do the two novels share in common? Do the works address the same themes? Though they might be assigned to the same genre, how are the two books different? Serena says that “[a]ll she wanted was [her] own world, and [herself] in it, given back to [her] in artful shapes and accessible form” (105). Later in the novel she explains that she believes that “[t]here is, in [her] view an unwritten contract with the reader that the writer must honor. … The invented had to be as solid and as self-consistent as the actual.” How do her statements correspond to Haley’s works? And to Sweet Tooth itself? Do both abide by this contract? In Chapter 8, Serena says that “Haley had got under [her] skin, and [she] wondered if he was one of those necessary men”—an “impermissible” thought, she adds (105). What does she mean by this? Why might this characterization of Haley be considered “impermissible”? Excerpts from Haley’s short stories are peppered throughout the novel. What impact does McEwan’s use of metafiction—described by The Guardian’s Julie Myerson as a Russian doll effect—have on the reader? How are the major themes of the novel mirrored—or otherwise contradicted—in Haley’s stories? Serena accuses Haley of “easy nihilism” (196). What does she mean by this? Does Haley’s own world-view, in fact, seem consistent with the view touted in his apocalyptic novel? Do Serena’s observations about “easy nihilism” affect your reaction of her actions throughout the novel? Pierre speaks to the employees of MI5 of “the hazardous terrain where politics and literature meet” (244). How does the novel speak to the subject of cultural freedom or control of cultural conversation? Is this topic still relevant today? Why doesn’t Serena tell Tom about her work? Could she have told him? Should she have? Consider Tom’s account of his discovery of Serena’s role in Operation Sweet Tooth. What does her dilemma and Tom’s reaction seem to indicate about ethics and morality? Are the views evinced by each character consistent with or in opposition to one another? What view of religion and faith is presented in the novel? Consider the descriptions of the church and evaluate Serena’s relationships with her father, The Bishop. How does his character—and her relationship with him—seem to shape Serena's character and affect her relationship with men henceforth? Revisit the scene where Serena returns home and cries on her father’s shoulder. What is his response? Is it one we might expect? What other kinds of faith are evidenced—or absent—in McEwan’s novel? How does the conclusion of the book change your view or perception of the preceding events and of the characters involved? Of the book’s overall messages and themes? McEwan seems to be employing first person narration, presenting an accounting as memoir. How does the shift in narration and voice affect your interpretation of the story?Are the narrators reliable? Consider the delivery of information and the relationship of this delivery to what we believe as readers and perceive as truth. How easy it for the characters to distort the truth but gain or preserve trust? How do these questions tie in with a larger conversation about propaganda treated in the novel? McEwan confirms that Sweet Tooth contains semi-autobiographical elements. What are these parallels and where do these parallels diverge or end? How alike are Haley and McEwan? McEwan and Serena? What does this tell readers about the relationship between reality and fiction—or else the disparity between the two? The novel contains information about writing and reading, but it also creates a dialogue about literary criticism. How do Serena and Tom differ as critics? What seems to shape their opinions? How is Tom’s own novel received by critics? How does this compare to the critique of the book by Serena or other employees of MI5? Likewise, how do Serena’s literary tastes change throughout the novel? Subversion plays a major role in Sweet Tooth. Consider not only how readers’ expectations are topped, but how the characters’ expectations are consistently defied. Many of the characters are not who we expect. In addition to the complexity of Serena’s character, Canning is revealed as a spy, Jeremy confesses that he is homosexual, and Max is engaged and so forth. What, then, does the novel suggest about what we can know—or what we cannot know—about others? About our own identity? What does Sweet Tooth reveal about the process of writing itself and the genesis of a work of literature? What does it reveal about reading? Consider Serena’s description of writing in Chapter 5, but also, what do Haley and his stories lend to this dialogue, or the account of Operation Mincemeat? Finally, what does the form of McEwan’s own novel contribute on this subject?